When it comes to looking after your dog in the summer, protecting them from sunburn probably isn’t something you would normally think of. The usual suspects are keeping them cool with plenty of shade and water, but believe it or not, dogs can get sunburn just like humans, and in extreme cases, too much exposure to the sun can cause skin cancer. While all dogs can get sunburn on delicate areas where there is little or no fur, such as their noses, ears, around the mouth and underbelly, there are certain dogs that are more susceptible to sunburn than others. 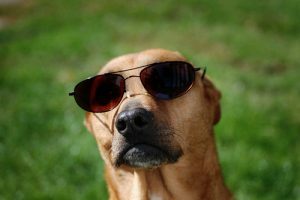 Hairless dogs or those with white or pale-coloured fur, such as Golden Labradors, Golden Retrievers, Pitbulls, Dalmatians, Greyhounds, Chinese Crested Dogs and Boxers are usually at a higher risk of getting sunburnt. Naturally, you can’t keep your dog locked up in doors all summer long, but taking a few preventative measures will help reduce the chances of your dog getting sunburnt, thus reducing the risk of developing anything more sinister like sunstroke or skin cancer. You should consider the time of day you walk your dog. Avoid dog walks during the hottest part of the day when the sun is at its strongest. Instead, try to take your dog out for early morning or evening walks when it’s much cooler. Although you should try to keep your dog indoors during the heat of the day, make sure that they are not lying in the direct sunlight streaming in through the windows, which can also allow penetrating, UV rays. You can safeguard your pooch, just as you would protect yourself, by applying some sunscreen onto the exposed areas, such as the nose, ears and underbelly or even opt for some sun protection clothing. Never use human sunscreen on your dog, as the perfumes and artificial ingredients can irritate their skin. It is important to avoid any sunscreen that contains Zinc Oxide, which is highly toxic to pets. Look for an all-natural, canine product, and remember when you apply the cream or lotion, that it’s highly probably your dog will attempt to lick it off. For this reason, the more natural product the better, to prevent it making your dog sick. You can use a home remedy to treat minor, superficial sunburn. Try a cold compress on the area, or cool your dog down with a bath. Vitamin E oil rubbed onto the affected area will sooth and aid healing or you could make an oatmeal soak, and apply to the skin. If your dog does get sunburnt, it’s important to recognise the signs and severity as they may need to see a vet. If his skin looks leathery, white or is obviously bright red, it’s likely they have had too much sun. However, there are three different types of sunburn in dogs that you should be aware of – superficial, deep and full thickness burn. The first affects just the top layer of skin and can usually be treated at home with Aloe Vera gel or a topical cream from your vet to cool the area. The latter two will require more serious vet’s treatment and can mean hospitalisation, as the sunburn has penetrated below several, or potentially all layers of the skin. This can be very painful for your dog, and even cause lasting damage to the tissue. To ensure your dog stays cool and sunburn free this summer, make sure you’re sensible when it comes to walking times and keeping your dog covered up, and always make sure they stay well hydrated.